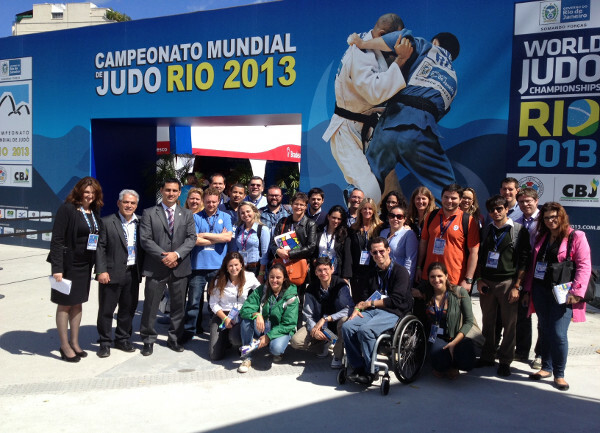 The 2013 World Championships served up a breathless day three as the flurry of ippon judo continued at the Maracanazinho on Wednesday. Two further world champions were inaugurated on day three as the women’s -57kg and men’s –73kg judoka took to the tatami. 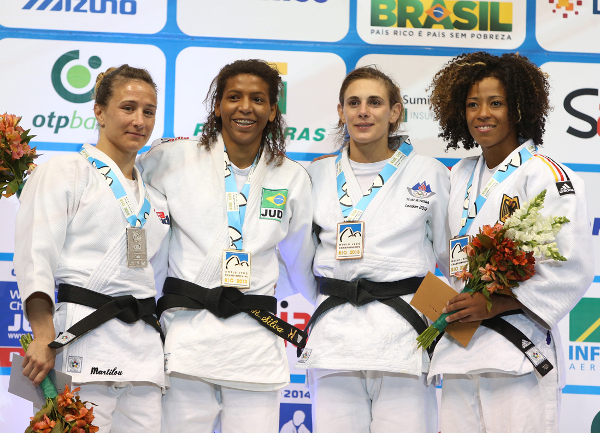 The Maracanazinho crowd saw 50 women and 78 men compete with the -73kg category the largest in the seven-day competition. The individual competition reached the halfway mark with the action continuing until Sunday 1 September when the team event brings the 2013 World Championships to an atmospheric close. With the judo extravaganza a natural test event for the Rio 2016 Olympic Games, a special visit took place during day three as Mrs. Lisa ALLAN, IJF Sports Commission and London 2012 Olympic Judo Manager joined Brazil’s 2013 World Championships bronze medallist and Olympic champion Sarah MENEZES (BRA) and Mr. Kenji SAITO, Rio 2016 Olympic Games Judo Manager. Distinguished guests in attendance at the Maracanazinho today included Mrs. Claudia BOKEL, Chairperson of the IOC Athlete's Commission. The Olympic fencing silver medallist is also a member of the IOC Executive Board with a particular interest in IJF’s own Athletes Commission which is set to introduce new members after the voting process closes on Thursday. After three days of competition, Japan continue to head up the medal table with three gold medals, ahead of Brazil and Mongolia. Moscow Grand Slam bronze medallist Rafaela SILVA (BRA) stole the show on the day three as she clinched Brazil’s first gold medal of the competition by defeating Marti MALLOY (USA). MALLOY, who made good on her promise that she would reach the World Championship final after winning gold at the Miami Grand Prix, was penalised for breaking grips with two hands as SILVA was spurred on by the capacity crowd. SILVA threw MALLOY with a ko-soto-gari which earned a waza-ari but the score was amended to ippon as the jubilant SILVA ran to hug her coach as the scale of her achievement hit home. SILVA earned a place in the final by dominating European champion Automne PAVIA (FRA) en route to a victory by waza-ari while MALLOY beat Miryam ROPER (GER) with a sumi-gaeshi being awarded ippon. The first bronze medal was won by 21-year-old former European bronze medallist Vlora BEDETI (SLO) who bested 19-year-old Junior world champion YAMAMOTO Anzu (JPN). The young stars of the category failed to trouble the scoreboard and the contest went down to shido penalties with three against YAMAMOTO and two against BEDETI who ran off the mat in tears of joy. The second bronze medal was won by world number three Miryam ROPER (GER) who avenged her European championship defeat to Automne PAVIA (FRA) with a fine win on the World Judo Tour’s highest stage. ROPER scored a waza-ari from a ko-uchi-gari but that was upgraded to ippon and an ecstatic ROPER screamed with delight. The 31-year-old German could barely believe what she had accomplished as the crowning achievement of an unbelievable year which had already seen her establish herself as one of the best performers on the World Judo Tour with results such as Grand Slam wins in Baku and Moscow. Japan’s youthful team continued to excel on day three as 21-year-old ONO Shohei (JPN) was crowned world champion with a superb win against Ugo LEGRAND (FRA). 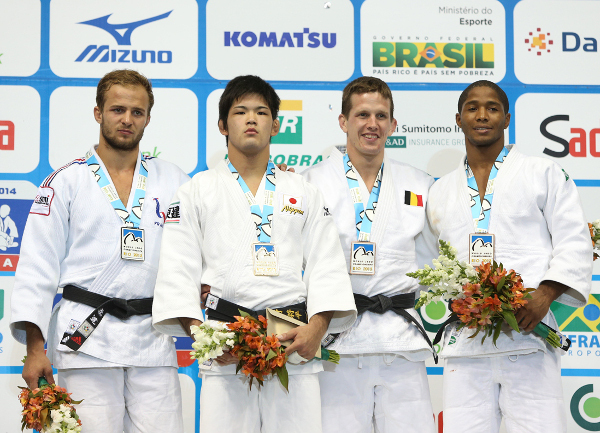 ONO, the 2011 Junior world champion and Paris Grand Slam bronze medallist, was expected to be severely tested against the accomplished and hugely experienced Frenchman who won bronze at London 2012. That challenge failed to materialise as ONO scored a yuko from an uchi-mata after 90 seconds and sealed the win with a flashing hane-goshi earning ippon. LEGRAND booked his place in the final by winning the showdown of London 2012 bronze medallists against SAINJARGAL Nyam-Ochir (MGL). A ko-soto-gake attempt from LEGRAND eventually earned a waza-ari having first been awarded to World Judo Masters winner SAINJARGAL and then corrected. The first bronze medal was won by world number two and Moscow Grand Slam winner Dirk VAN TICHELT (BEL) who battled past surprise package Dastan YKYBAYEV (KAZ). After YKYBAYEV received two shido penalties for passivity VAN TICHELT sprung forward into action and threw with a drop seoi-nage for a waza-ari. The second bronze medal was won by two-time world silver medallist Dex ELMONT (NED) who saw off the challenge of SAINJARGAL. ELMONT went ahead with a yuko and confirmed the final place on the medal podium as he anticipated an attack and stepped to the side to push over the Mongolian with pure upper body force.